Kero-World's newest style convection heater features a consumer friendly design which allows automatic wick raising without first "resetting" the emergency shut-off. 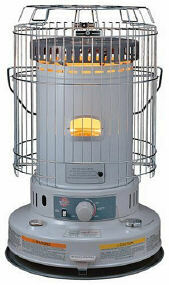 As with previous Kero-World models, the design of this heater starts with a rugged steel frame and features sturdy construction throughout. All major internal components are machine stamped and quality checked to reduce problems for you. The heavy gauge metal cabinet is finished with an attractive 2-tone porcelain enamel paint finish to insure lasting protection. Rugged steel structure and 2-tone gray porcelain enamel finish. Electric start ignition, automatic accidental tip-over system, and adjustable low/high heat settings. Siphon pump included. U.L. listed. Recommended Heating Area: 920 sq. ft.
Dimensions (WxDxH): 18.7 "x 18.7"x 27"